From the Preface by V. S. VARADARAJAN: "These volumes of the Collected Papers of Harish-Chandra are being brought out in response to a widespread feeling in the mathematical community that they would immensely benefit scholars and research workers, especially those in analysis, representation theory, arithmetic, mathematical physics, and other related areas. lt is hoped that in addition to making his contributions more accessible by collecting them in one place, these volumes would help focus renewed attention on his ideas and methods as well as lend additional perspective to them." 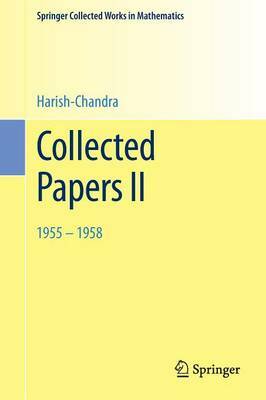 The papers are arranged chronologically, Volume II collects his articles written between 1955 and 1958.